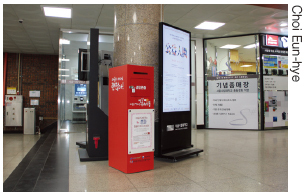 The Red Mailbox is a mental health program that was implemented by the Dongdaemun-gu Mental Care Center. This program was opened for people who suffer from depression and want to receive counseling. The method of participation is as follows: First, find the a red mailbox on the first floor of the Student Hall. Next, get a letter from the box. After that, write down your feelings and concerns on the letter. Then, put the finished letter back in the red mailbox. After inserting the letter, wait for a response. The welfare center will contact you soon to request your permission to proceed with a counseling session. You can receive counseling either by phone or in-person at the visitor’s center. The center can perform various tests to assess mental health, provide counselling and education, and initiate treatment programs. So, if you are having a hard time and feel alone, you should get in touch with the red mailbox program. 1. I think everything is boring. 2. I cannot sleep well. 3. I feel extremely lonely. 4.I do not want to socialize with others and want to be alone. 5.I usually feel anxious and cry all of sudden. 6.I want to get away my current situation. 7. I feel like I want to die. 8.Do you empathize with any of these feelings? For more information about partici-pation, information is available on the following website: ddmind.net.